The world of smartphones on a global level is dominated by the big players in the market? Apple and it’s behemoth the iPhone, Samsung with its powerful line of Android enabled Galaxy line of smartphones. The smaller Android manufacturers are also in the game, with HTC, Sony and LG producing some great hardware. The flagship models of these companies capture the imagination and the wallets of smartphone aficionados around the globe. All the talk in the tech-sphere is whether the new iPhone 6 with its rumored bigger screen will be able to challenge Samsung’s firm grasp on the 5 inch phones market, or whether the new HTC One will finally live up to expectation and be the hit everyone is expecting it to be. In the Indian market however, things are developing in an interesting manner. Although Apple and Samsung are instantly recognizable brands and their latest creations in the smartphone field are revered by the media and by the customers, a crop of local smartphone brands are making waves and challenging the big players for a sizeable share of the Indian smartphone market. These developments show that Indian smartphone buyers are eager to browse the market, compare products and yield the maximum return of their investment. This is the value that local smartphone manufacturers can deliver. Among the most popular smartphone brands that originate in India is Micromax, a brand that has a sizeable lineup of smartphones covering all screen sizes popular today, and delivering solid performance only for a fraction of the price. Consumers are taking notice of the rise of Micromax, evidenced by an average of 700,000 monthly searches on Google for their brand name and associated smartphone models. People are actively searching for the Micromax offering of smartphones and the demand for it has pushed the majority of online shops in India to list them as part of their inventory. 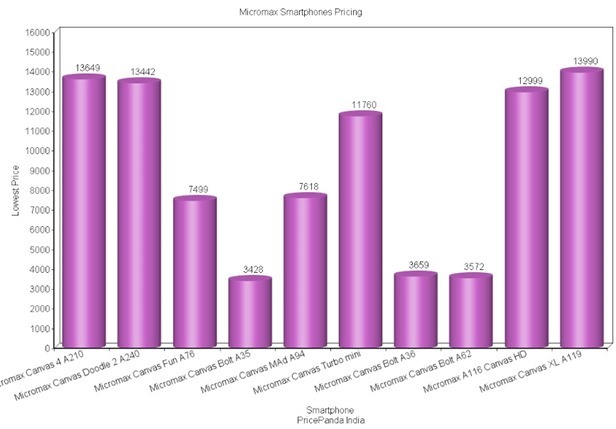 The offering from Micromax are very diverse and they have flagship models like the Micromax Canvas 4 A210 which is sold between Rs 19,999 and Rs 14,439? and also there is their Bolt line of smartphones that are more to the low end of the market and can be found for anywhere between Rs 3,349 and Rs 5,550. The current trend that is developing is that consumers are most interested in larger Micromax devices, those that feature a screen size above 4.7 inches. 75% of visitors that come to PricePanda’s Micromax products are searching for a large screen device. XOLO and Karbonn are the other two local smartphone brands that are challenging Micromax and the already established players in the smartphone market by offering capable devices at reasonable and attractive prices. There is an increased interest in these two brands as the numbers are clearly showcasing? XOLO is drawing 135,000 searches on Google and Karbonn closely follows with 130,000. These trends are not left unnoticed by the online shops that cater to the Indian market. PricePanda’s statistics and insights show a strong appeal of the XOLO Q500 and XOLO Q600 series of smartphones, and in particular XOLO A500s has been getting 40% of the traffic from users interested in XOLO related themes and search terms. This speaks volumes to the thought that Indian smartphone shoppers are looking for a capable device at the fraction of the price they would pay for an iPhone or a Samsung Galaxy. The XOLO A500s’ price range is Rs 6,139 ­ Rs 7,299. Gionee is another notable brand of Indian smartphones that is making waves in the smartphone market. PricePanda’s insights report a strong interest for the Elife series of Gionee smartphones that are getting a staggering 80% of all traffic coming that is originated from Gionee related searches and queries. The company made headlines a couple weeks ago announcing the Elife S5.5 dubbed the world’s slimmest smartphone, coming in at just 5.5mm. This is a direct attack on Samsung’s efforts to make their smartphones as slim as possible. It goes without saying that the Elife S5.5 is considerably cheaper (approx Rs. 23k) than the offerings from the established brands. The battle for the premiere Indian smartphone brand is in full swing. 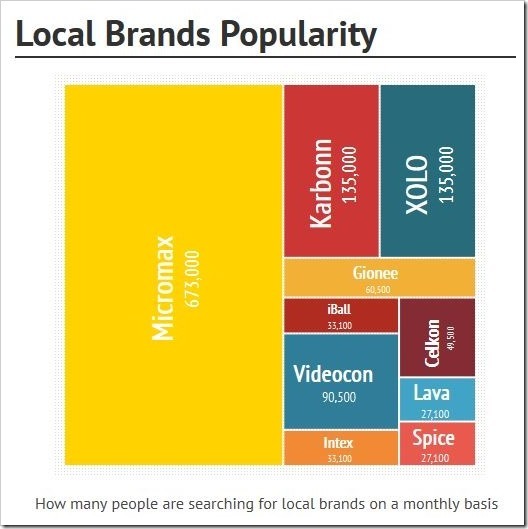 As proved by relevant data in terms of monthly searches, and actual statistics on users behaviour from consumers interacting with these local brands, it is safe to presume that Micromax, XOLO, Karbon, Gionee and other up­-and­coming Indian smartphone brands are ready to take the battle to Apple, Samsung,HTC and the other established brands.